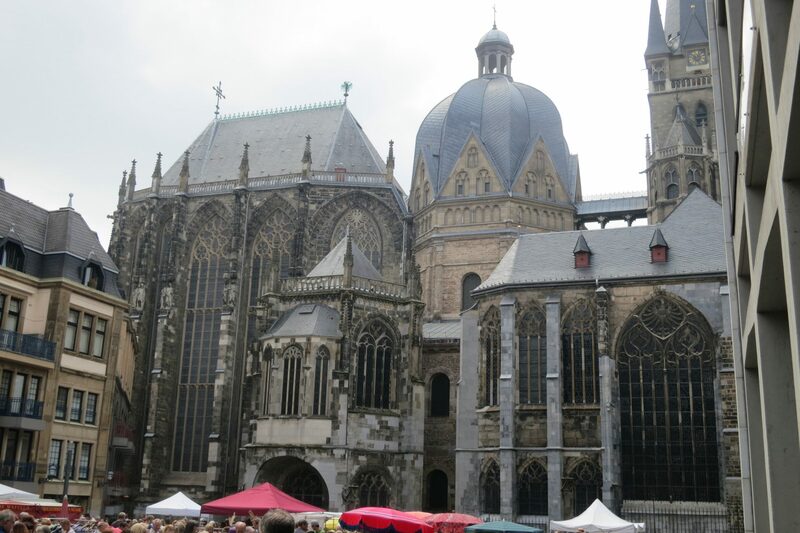 Aachen was the first foreign City I ever visited. It was a lunchtime stopover on a school trip to Bavaria. We were released from our coach for an hour to eat sandwiches and stretch our legs. I remember peering in to the windows of C&A, being amazed at the range of eclectic goods available in Tchibo….and not much else. Many years later I found out that Aachen was Charlemagne’s capital and regretted wasting my lunchtime. Forty years later I am making sure my children are in no doubt about Aachen’s place in history. First stop the Cathedral: outside it looks like any other Northern European Cathedral but inside is a different matter. Every surface is festooned with glittering glass mosaic reminiscent of Orthodox Churches. Charlemagne started the construction and he would recognise the soaring central octogon. 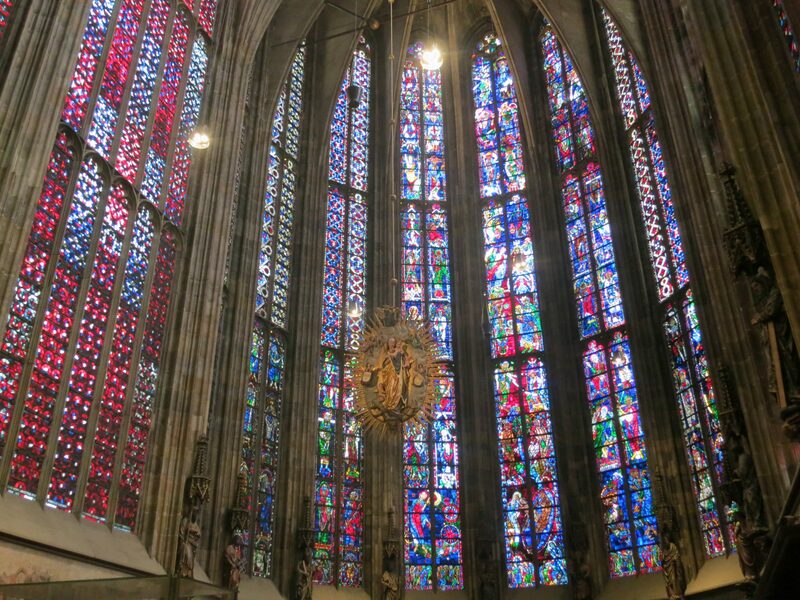 The Junior CW’s declared the stained glass windows to be the best ever, the originals were destroyed in heavy war time bombing and the ones you see today were installed in 1951. Even once Aachen ceased to be capital after Charlemagne’s death, the Cathedral remained the place where German Emperors were crowned. If you are organised you can pay €4 and go on the daily English language tour at 2pm, sadly the tour was fully booked when I turned up at ten to two. 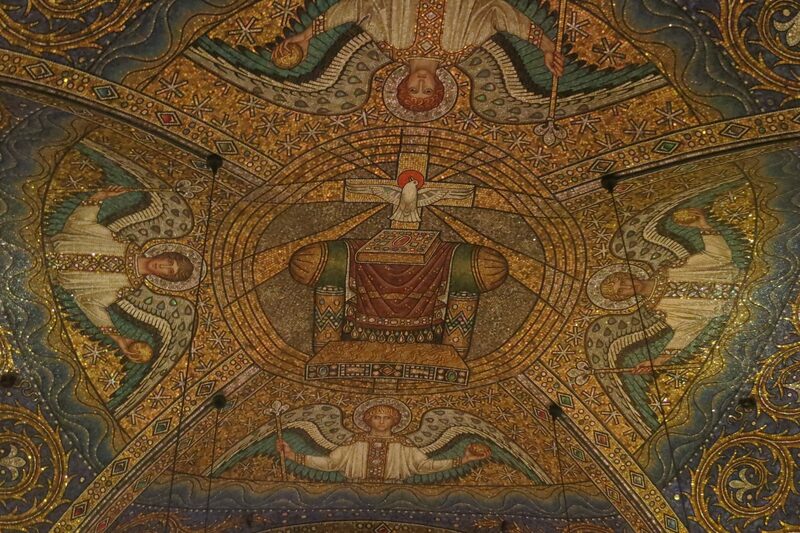 The tour gets you up close to Charlemagne’s tomb and you get to see the Imperial throne. The Rathaus was part of Charlemagne’s palace complex but much rebuilt in the intervening twelve centuries. On the first floor is the splendid Kroenungsaal where newly crowned emperors held their coronation banquets. This year the hall is given over to an exhibition entitled places of power to mark the 1200th anniversary of the great man’s death. You learn about the growth of the empire, the importance of Aachen and see it compared to other places of power. Almost everything sparkles in the Dom Schatzhammer or treasure house. Charlemagne’s bones have not been allowed to rest in peace. Following his sanctification, various bits were transferred into splendid reliquaries. Most impressive of all are a vast glittering bust and a huge silver gilt arm. The Lothar cross, bejewelled and dating from 1000 holds court in a room of its own. Whilst in Aachen we stayed in the Ibis Styles hotel, which provided us with a spacious family room, breakfast and most importantly of all free wifi. We dined at the Golden Swan on Markt; sausages and schnitzel proving a hit with the boys and gorged ourselves on cream cakes at Nobis just outside the cathedral. So nice! There are so many places to visit in Germany. Feel like I need to devote like three months to just that country. We shall be going back this summer!